This particular application provides all the functions such as a file manager, application manager, task killer, cloud storage client compatible with Dropbox, Google Drive, SkyDrive etc., FTP client and Samba Client in one handy little app. It also provides access to all your pictures, music, videos, documents, and whatever you have on your memory card. You can choose to share these files with other device if you wish and or choose files to e-mail, share on Facebook, Twitter and even Whatsapp. More than that it is available in over 31 different languages. That latest update brings an overhaul to the interface. The aesthetics are more pleasant to the eye and the overall design of the application is cleaner with the clutter disappeared. You can swipe across the screen to access different directories such as local storage, Cloud, and LAN. You have nine different viewing styles available to you starting from small icons to large icons to details just like in Windows. You can sort the directories according to alphabet, size, date modified and the sorts. You also have a fast access menu available allowing you to quickly navigate to the App manager, Download manager, System manager, SD Card Analyst, Root Explorer, Remote manager, Net manager, clipboard and hide list. Furthermore, you have the options to add different directories that you frequently use to this fast access menu to further ease out the entire navigation process. 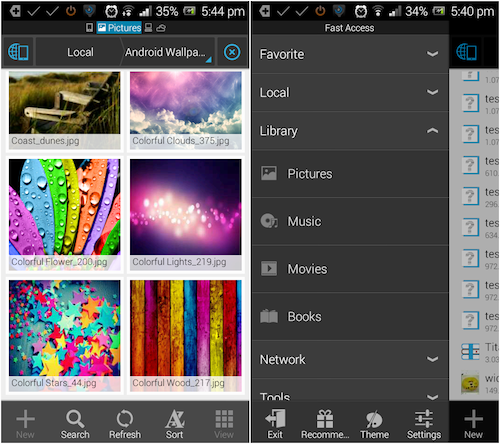 Lastly, users can download visual themes that would suit their fancy to make the app look more in-style. Conclusively, this is a fast application and now more aesthetically pleasing than ever and is worthy of being installed in every single Android device. You never know when a file explorer might come in handy so its better to have it in your arsenal of applications installed, besides, it is not that heavy and operates flawlessly.